Jeff Ross, 'Roastmaster General,' On Having Thick Skin Ross says he learned to "dish it out and take it" as a kid in Newark, N.J. He says that ideally a celebrity roast is "like a party where everybody goes and has a good time." 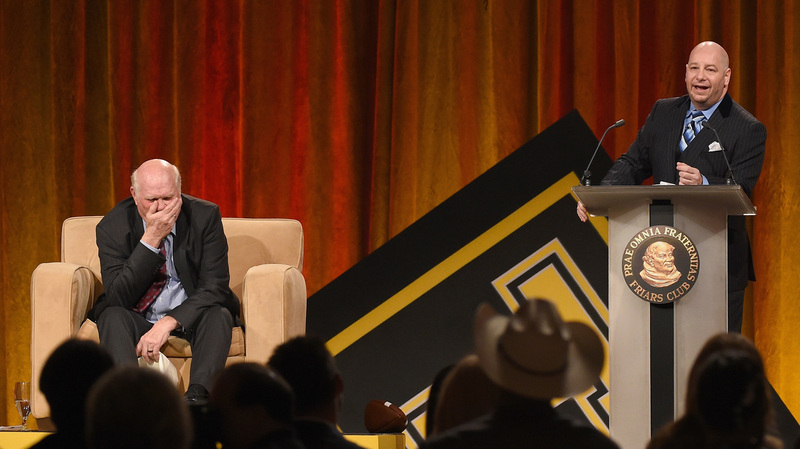 Jeff Ross (right) roasts TV analyst and former NFL quarterback Terry Bradshaw at the ESPN Super Bowl Roast in January 2015 in Phoenix, Ariz. Comic Jeff Ross makes his living insulting people. As a producer and performer for Comedy Central's celebrity roasts, Ross has hurled withering punchlines at celebrities like Donald Trump, Justin Bieber and, most recently, Rob Lowe. Dubbed the "roastmaster general," he's also hosted roast specials at a Texas jail and at a Boston police precinct. Ross tells Fresh Air's Terry Gross that he learned how to "dish it out and take it" as a kid in Newark, N.J. "My Uncle Murray — we called him 'Mean Murray' — he used to pick on me constantly, but he did it with love," Ross says. "He was giving me thick skin. That's what you need to survive in this world." Ross calls his humor a "survival technique" that has helped him through the darkest periods of his life. "My parents passed away when I was a teenager," he says. "Using comedy as a pressure release ... valve in life really kept my sanity." I want the roast to be like a party where everybody goes and has a good time. Though the roasting can at times be very mean, Ross maintains that his ultimate goal is to tell jokes that everyone can laugh at — including the roastee. "I want the roast to be like a party where everybody goes and has a good time," he says. I'm pretty careful about the things I say, ahead of time. I'm thoughtful about not going too far. The only thing you can do occasionally is be too much. I like to stick and move, Terry, one joke about everybody, one or two jokes about everybody. Every now and then I'll stop and do five or six, if I have a really good target. Like, we added Ann Coulter to this recent Rob Lowe roast, and she was sort of a last-minute addition. She wanted to promote her book, but I thought, "You know, Rob Lowe is kind of a fun target, but Ann Coulter, there's somebody I can really turn the heat up on." She's a pundit. She's in politics. She can take it, of course. Instead of kind of doing the material, the very self-aware material that our writers wrote for her, she decided to do her own thing, which was more divisive, and the first thing she did was take her new book out and prop it up on the podium so the whole thing came off as a book plug. She chastised the writers for "making me be mean" and she yelled at the teleprompter people, and so she showed no vulnerability at all and didn't seem to be having fun, and I think that's why her set maybe backfired. She got some boos and so on. Now she's claiming that we edited it to make her look worse, so I'm not really sure what's happening in her brain. She was very lovely before the show, I did not get to see her afterwards. I'm not worried about her, Terry, she's a very tough woman. I think she's the only woman ever to sexually harass Roger Ailes from Fox News. Justin Bieber called Comedy Central and said, "I want to be roasted. I've had a rough year, I've been arrested, I've gotten a lot of bad press, I need to reboot myself before my next album comes out. I want to be roasted, I am volunteering to be roasted." And that wound up being great for him. He had a No. 1 album right after that roast, and he needed that reset album. Other times we reach out to people. Yes, of course we've called Kanye. Of course we've called some of these more notorious figures. But they're hesitant because they don't want to be made fun of. I get that, too. To take it one step even further, Terry, more and more I am seeing at my shows disabled people volunteering to get roasted. I had a woman in Austin get picked up, she was in a rock band called Wheelchair Sports Camp, and her band carried her wheelchair on stage, she wanted to be normalized. There's no such thing as a normal-looking person anymore. We're all different. ... My best friend is disabled. There's nothing he hates more than being left out of the jokes, to be treated with kid gloves, that's the insult, when you treat somebody too soft. People want to be part of the fun. My sister and I we felt different. People looked at us different. There's obviously people in the world who have it much, much worse than we did: We had each other, we had our health, and we were teenagers and we had friends and family around, but we did really feel like we were alone, and a team. I switched her financial aid around and we wound up both going to college together up in Boston at Boston University, so we had each other's back in that way. We have a great bond still to this day. ... I realize how sad it is, but at the time it just was life. I didn't know anything else. I became everybody's rabbi; everybody who needed advice would talk to me. ...I realized ... that we're made to mourn and then move on. Life has to keep going. So you can either be a victim the rest of your life and let it drag you down into drugs and alcohol and depression, or you can turn it into something good, fun even. And I tell young people who are going through depression that this might the most important time of your life, this might be what makes you a great artist later on.